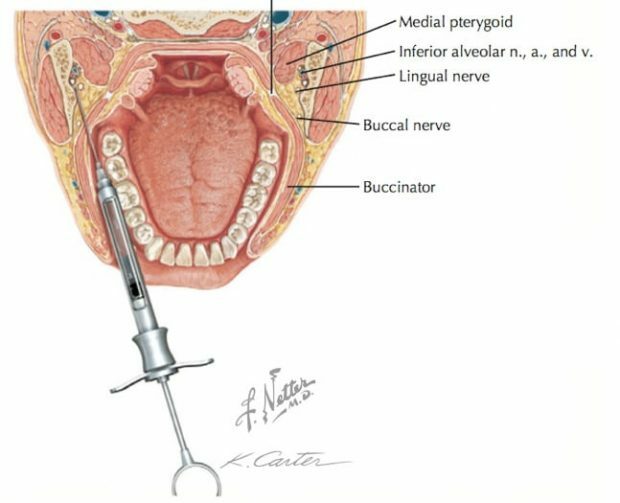 In this video uploaded by FreeDentalEducation, an instructional video guide about how to properly administrate Mandibular Anesthesia – Inferior Alveolar Nerve Block. Apply topical anesthetic to the target area, which is the mucosa lateral to the pterygomandibular raphe but medial to the anterior border of the mandibular ramus and about 6-10 mm above the occlusal plane of the maxillary teeth. With the anterior ramus technique, palpate the anterior border of the ramus with the thumb and find the greatest concavity, which is the coronoid notch. 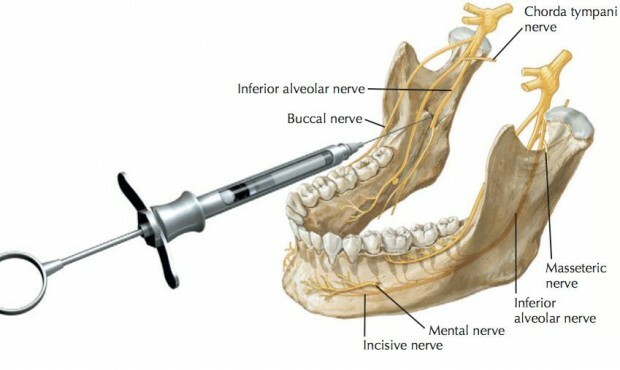 Orient the syringe so that the barrel is in the opposite corner of the mouth, resting on the premolars. With the anterior ramus technique, use the middle finger and thumb to determine the width of the ramus in its anterior-posterior dimension. Anatomically, the mandibular foramen lies in the middle of the ramus in this dimension. The average width of the ramus, including the thickness of the soft tissue in the coronoid notch, is approximately 35 mm, which is also the length of the needle. Aim toward the index finger and slowly penetrate the mucosa until bone is contacted. Bone is usually contacted within about 2.5 cm. If the attempt does not result in contact with bone, reorient the syringe more laterally and repeat attempt. 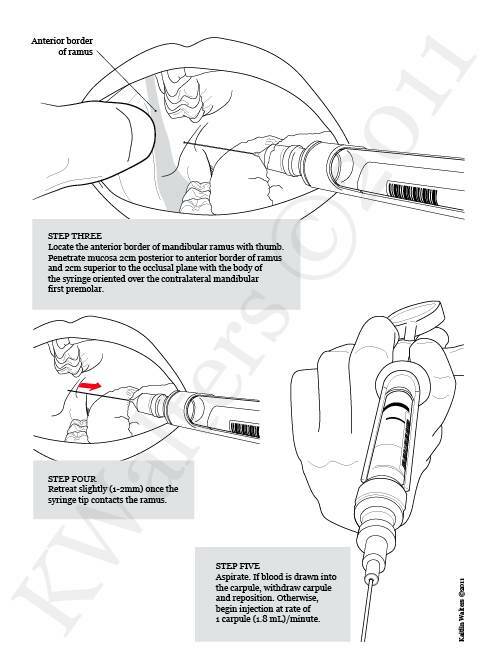 Rotate the bevel of the needle and re-aspirate; if no blood is returned, inject 1.5-2 mL of anesthetic. 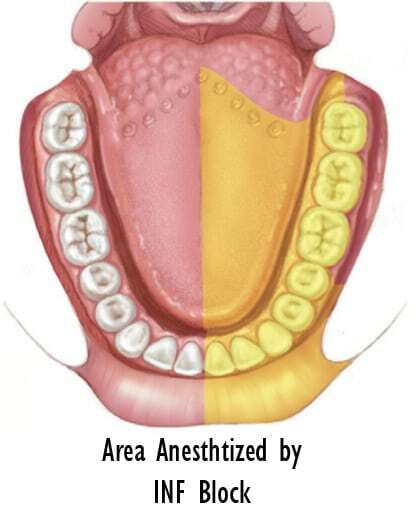 If aspiration is positive, pull back about 5 mm and redirect slightly, then repeat attempt at aspiration. If the injection fails to result in adequate analgesia, it may safely be repeated 2 additional times. Patients often report mild jaw muscle soreness for 2-3 days following this injection. Video By FreeDentalEducation Youtube Channel.